One ancient story is popular about the Shri Ganesh Chaturthi. According to story, Lord Shiva and Goddess Parvati was seating near the Narmada River. Goddess Parvati said to lord Shiva to play Chopad to spend the time. Lord Shiva was agreed to play but he was confused who will decide the win or lose? The question arises, in this regard lord Shiva take some leafs and made one statue and gave the soul. He said to that statue that we want to play Chopad but nobody is here to decide our win or lose so you will decide who win or lose. After that they started the Chopad. It played three times. Goddess Parvati won all the three times. After finishing the game child has asked to decide the winner then he declared Shiva as winner. Goddess Parvati became angry after listening this and he pulls the child and curses him to become handicapped and leaving in dirty place. Child regrets in front of the Parvati and said that he did this unintentionally. He has not done this in any revenge. Parvati said that child that girls will come over here to worship Naag. You have to do vow according to it and you will get me. Goddess Parvati went over to Kailash Mountain with lord Shiva after saying this. Naag girls come over there after one year. Child gets the information about the vow from Naag girls and did vow for 21 days. 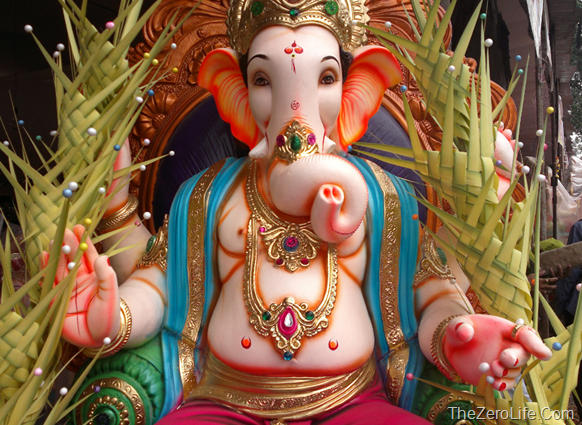 Ganesh impressed after seeing his religious belief and asked him want he wants. He asked to Ganesh that he will give that much energy so he can walk till the mountain of Kailash and see his parents. Ganesh gave this blessing and went away. Child went to the Kailash Mountain. He told this story to lord Shiva. From that day Parvati became reluctant from lord Shiva. Child said to lord Shiva that he did 21 days vow according to lord Ganesh’s instructions. Bholenath convince the goddess Parvati. Lord Shiva said this decree to goddess Parvati. She was also wanted to meet her son Kartikeya. She also did vow for 21 days and offer Durva, flower and laddoo. On the 21st day Kartikeya came to meet Parvati. From that day the vow of Ganesh Chaturthi consider as desirable vow. The born of Shri lord Ganesh was on the fourth day of Shukal Paksh in Bhadrapad. So, people do fast and celebrate on this day. It is consider as Mahachaturthi vow when it is on Sunday or Tuesday. The decree of this vow is similar to Shri Ganesh. The vow of Ganesh Chaturthi does on every fourth day of Krishna Paksh but this vow does only on the birth day of lord Ganesh. People get good result by vowing on fourth day of Madh, Shravan, Bhadrapad and Margashirsh month. The person who is doing fast on this he has to wake up early in the morning. He has to take bath before sunrise and complete his schedule and pour Gangajal into the home. It is also beneficial if you add white sesame in bathing water. After worshiping in the morning you have to chant “Om Gam Ganpataye Namah” in afternoon. You should offer dhup, Durva, lamp, flower, dainty and water to lord Ganesh. You should offer red clothe to lord Ganesh and if this is not possible then you can donate it. You should worship by offering 21 laddoo which are made from ghee. You have to keep 10 laddoo with yourself and donate other stuffs to Pandit with donation.